This is the Wowtac (fomerly Atactical) A3 zoomable flashlight , sent to me for my review and NO other compensation other than keeping the light. You can find the Wowtac A3 at either the main site…. (links are NON affiliated)……. Or on Amazon site …. https://www.amazon.com/dp/B074V77QFR … for $19.99 on either site at the time of this review. The A3 is the newest in the line up from Wowtac , which seems so far to be bringing us some good quality lights for a decent (budget) price. Wowtac receives technical support from ThruNite for thier products and it seems to show in the build quality of the lights I have received from Wowtac so far (5 of them) as the quality of the lights has been very good with all of them. The A3 is a pretty compact 18650 sized ZOOMABLE light with a side switch ONLY for controlling On/off and all the modes. The switch itself is a nice looking metallic one and compliments the light. I personally do not know of other zoomies that incooperate the side switch only feature. This particular model uses a XP-G2 emitter with what seems to be a constant current driver. The light is unfortunately glued or sealed VERY well , so I have not tried to force it apart as I didnt want to damage the light before I could finish the review. ( even the bezel is rock soild on my sample) The color temp is a cool , but not like super cool , I am guessing in the 6000K to 6500K range , but it does look a little warmer when the light is in flood mode than it does in the focused mode. As mentioned already , the quality of the light is really good , especially for a light that only cost $20. When I took the light out of the box and inspected it carefully I could not find any thin or bare spots in the Anodizing anywhere. The square cut threads were lubed just about right and they are smooth when screwing the tailcap on or off. The head moves smoothly to get the beam where you want it , but the light is so air tight that you may have to hold the head in place when fully extending for focused mode or going to full flood mode as the air trapped inside will push the head back slightly from the pressure. I found if I just hold the head in place a few seconds when adjusting it stays put then without creeping back. The head does stop just short of full focus , meaning you dont get the really defined edges showing from the emitter or see the dots from the die. Personally I prefer this and usually pull slightly back to get rid of the focused die on my other zoomies , but I know some also prefer the focus to go that extra 1 mm or so to get the full die focused. I like the UI on the A3 which has the hidden strobe and also the hidden “ultra low” as they call it , I call it Moon mode , but either way it is a long press (about 1 second) to activate that. The hidden strobe can be accessed from the Turbo mode with a quick double click , or 4 quick clicks in a row from any other mode. The rest of the modes are Low / Medium / High /Turbo. The Low , Medium and High modes can be accessed with a long press (3/4 to 1 second) or you can simply hold the button down and cycle through each mode and release the buton when the desired mode is reached. The Turbo is a quick double click from any of the other modes including if you are in strobe , just double click back to Turbo. A quick click turns the light on in the last used mode for L / M / H and another quick click turns the light off. EDIT: I forgot to mention that the A3 does have a Turbo step down. At 4 minutes and 30 seconds , the lumens start to decrease gradually until the step down stops at 349 Lumens. After that it is a very slow drop the rest of the time until the 286 minute mark when I got the Low Voltage warning , as noted in the charts below. Overall the A3 is a very nice light IMO , with a good UI and overall it seems to be a very good quality light with excellent run times. I would like to see the A3 (and the A3S when it becomes available) have a choice of neutral or cool emitters though. 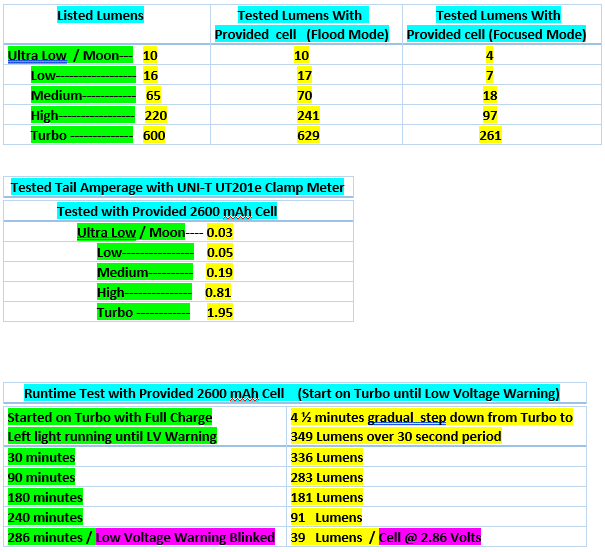 Below are the test charts from the testing I have done witht he A3 so far , followed by the video and then under that the listed specs. For those who do not want to watch the whole video the Still pictures and beamshots start at 6:26 of the timeline and the outdoor live footage starts at 10:31 of the timeline. •LED: CREE XP-G2 LED with a lifespan of 20+ years of run time. •Runs on: Wowtac li-ion 18650 battery (3.6V/2600mAh). Thanks……Always glad to do the reviews. I don’t know if there is still a coupon code on it or not , but you could contact Freeme , as he is the one that had the GB and codes on it back at that time. There are a good many of the members here that use the same meter. Thanks for the meter info Robo819. Coupon for meter still works at Banggood. Those Wowtac flashlights sure seem nice at a low price. Might have to buy one soon. No problems on the meter info……….. If you add an O-ring under the bezel it will bring the focus pretty much to a sharp defined edge when in the zoomed focus. The bezel IS glued in though and takes some pretty good Umph to get loose. I used the bottom of a tennis shoe , with A LOT of downward pressure to finally get it broke loose. I am sure a tire tread or anything that is a pretty solid surface and very sticky , or grippy would work though. Once the bezel is loose , clean the glue off the threads as best you can and then tighten the bezel back down good and tight on the added O-ring and it should seal off well and have the much more defined focus. You don’t want a real thick O-ring though.